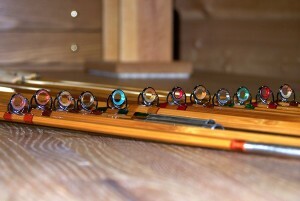 I use only the finest Tonkin bamboo, use the strictest rod building practices, and use the finest rod building components to create a split cane fly rod that not only is a perfectly balanced fly fishing tool, but also one that is aesthetically pleasing to the eye. 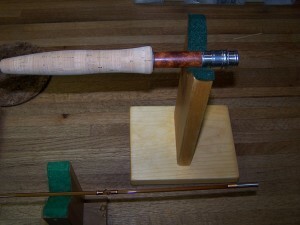 One of the first considerations you will need to make is the “tone” or coloring of your rod. I usually like to “Flame” the culm prior to splitting it. Though my bamboo is well seasoned this flaming tempers the bamboo. 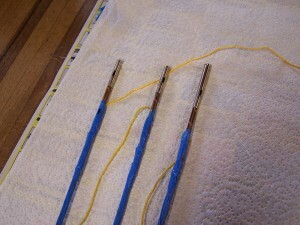 Usually the darker the tone the stiffer or faster the action is, for a particular rod taper. If done properly (not to hot) the bamboo retains all the structural strength and becomes tempered as a piece of steel would be, the rod reflects the degree of temper in the tone of color. All rods are still heat treated in the course of fabrication, to relax and orient each strip in relation to the position it will hold in the finished rod. 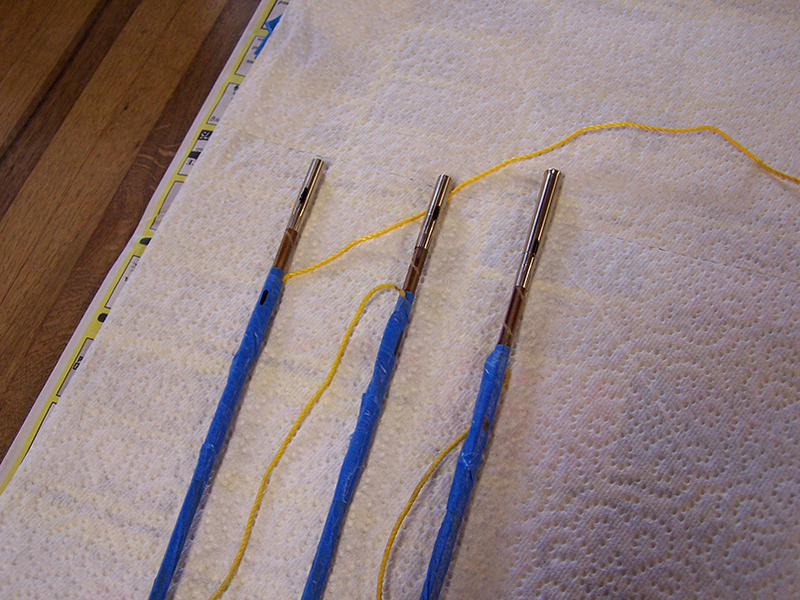 Depending on the amount of heat, and time under heat, this procedure can temper the rod to a certain degree. This is done under a strictly controlled environment. We will discuss the flaming that would be right for you and the taper you pick out. 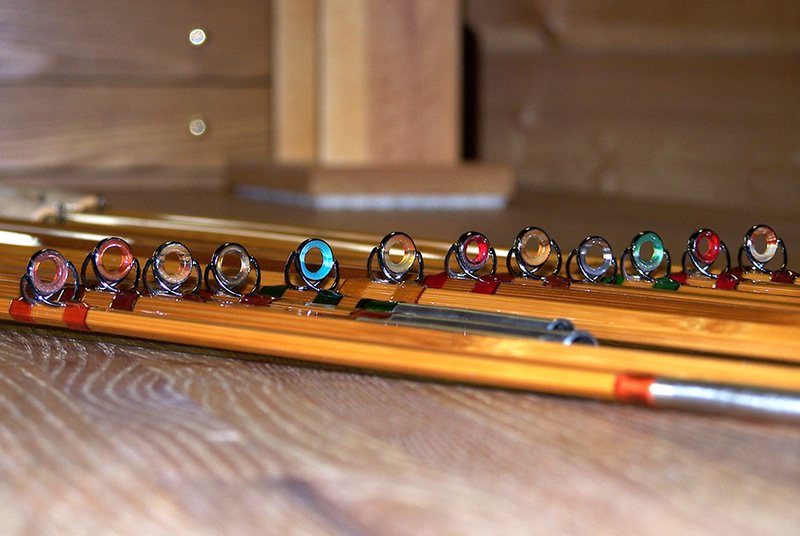 The standard ferrules I use are Super Swiss manufactured by Bailey Woods at Classic Sporting Enterprises – The Best. My standard guides are blackened Nickel Silver “Snake Brand” guides made by Mike McCoy in Battle Mountain Oregon. The standard for the industry. 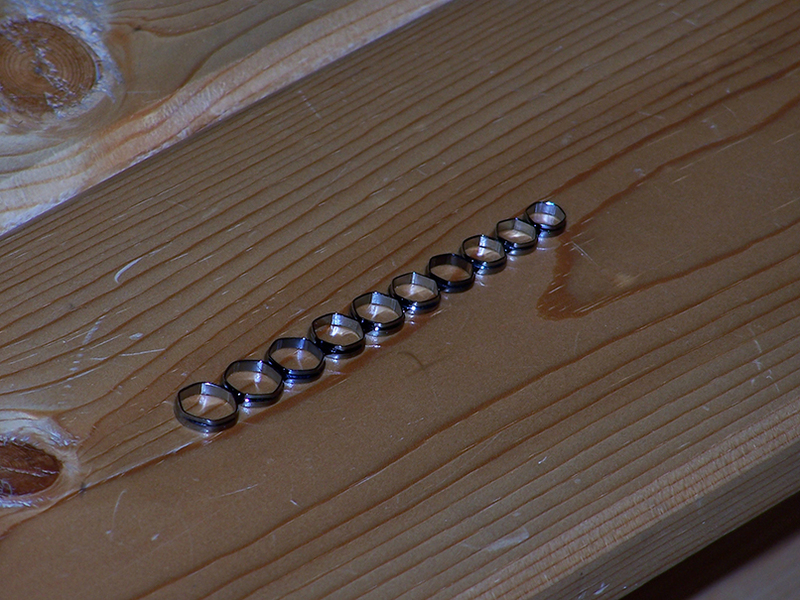 Though I do have other guides if requested such as bronze, copper, bright nickel silver, black etc. Whichever the client prefers. Standard is a blackened nickel silver “hex check” that matches the guides. But here again it is up to the client. Fuji style folding hook keeper, folds flat when not in use, black or silver. Ring and band folding hook keeper, and the traditional U-shaped hook keeper. My favorite, it is always ready to use especially when your hands are cold or wet. 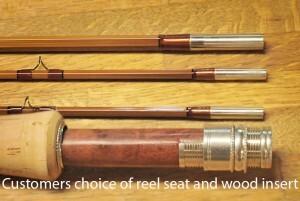 The reel seats and wood inserts that we use for rod building are manufactured by R.E.C. And Mike McCoy at “Snake Brand”, some of the finest reel seats in the industry. 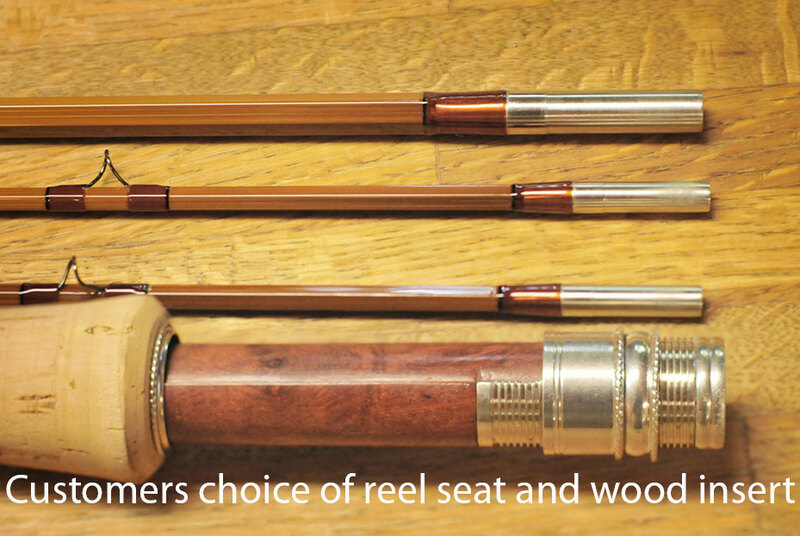 The large choice of reel seat designs and exotic woods to choose from between these two fine companies assures our clients the best reel seats available. 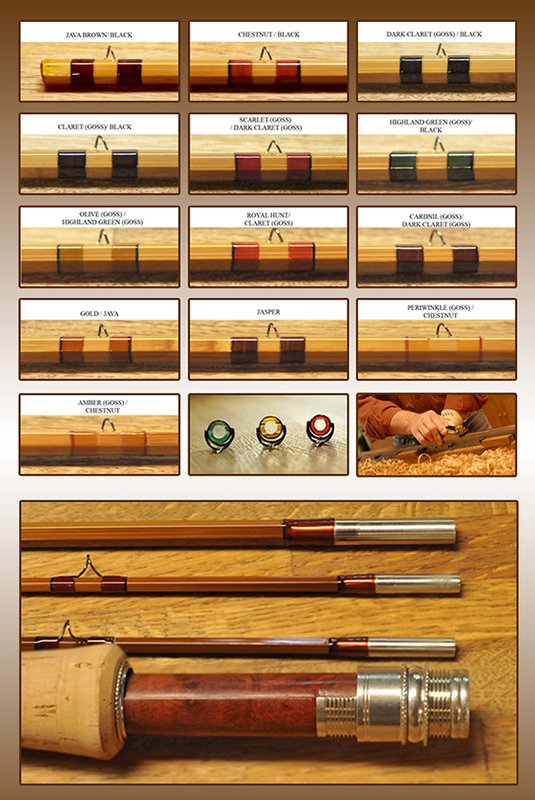 This will help create a uniquely personalized rod that they will appreciate and cherish for years to come. My standard combinations are the NSUS up-locking reel seat with the rope knurling (a classic look) or the CRN Cap & Ring model with rope knurling (wedding ring model). With rope knurling. Using the Coco bolo wood insert with a darker flamed rod or the Amboyna wood insert with a medium flamed rod. Check out their web sites and see what you prefer. Most handles are the standard Western, Cigar, full Wells, and Half Wells styles made with flor grade cork in the length of your choice (standard sizes are 5 – 8 inch’s) But I will build any Custom shape you prefer in the style of your choice and size of your choice just give me the dimensions. The standard stripping guides are beautiful jewelry grade Agate with black nickel silver frame the color to be chosen to compliment the rest of the rod (with the approval of the client) usually a variation of the silk thread color. My standard thread is Pearsalls’s “Gossamer” silk thread in the color of your choice. Favorites are Chestnut with black tipping, (goes well with the amboyna wood insert, Java with black tipping (Beautiful on a dark flamed rod with a cocobolo reel seat). My dark flamed 8053 looks great with an old red stripper I acquired somewhere and the red thread. Green with black tipping and a green agate is also popular. 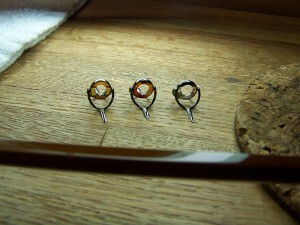 But look at the thread colors and decide for your self what would look good on your rod.